Quality tradesmen aluminium ladder with 150Kg rating. Maximum length when fully extended is 6.5M. Quality tradesmen aluminium ladder with 150Kg rating. Maximum length when fully extended is 8.9M. Ladder is 120Kg load rating. A- Frame ladder height is 1.72M. Maximum length when fully extended is 3.3M. Ladder is 120Kg load rating. A- Frame ladder height is 2.31M. Maximum length when fully extended is 4.5M. This ladder has load rating of 150Kg. Length when fully folded is 3.1M. Platform height is 2.1M. 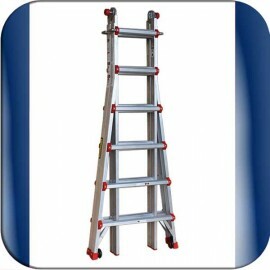 Quality tradesmen aluminum trestle ladder with 150Kg rating. Ladder height is 2.9M. Quality tradesmen aluminum trestle ladder with 150Kg rating. Ladder height is 3.6M. Maximum length of the ladder is 5.7M. Folded height is 1.7M. Step Ladder height is 3M. Load rating of the ladder is 120Kg. Ladder comes with rung platform & two fitted wheels for comfortable use. Maximum length of the ladder is 7.0M. Folded height is 2M. Step Ladder height is 3.6M. Load rating of the ladder is 120Kg. Ladder comes with rung platform and two fitted wheels for comfortable use. This Attic Ladder has maximum load rating of 170Kg. Fits for ceiling heights from 2.3M to 3.1M. User friendly opening and closing system. Quality industrial duty ladder with 150Kg rating. Insulation Capacity 10KV. Maximum length when fully extended is 5.35M.